There is no event that Letizia Silvestri cannot plan. She is a true master at utilizing a budget to its fullest, and working with strategic partners to go the extra mile that was originally thought impossible. For example at O’Gara Coach, treating clients as well as potential clients to exclusive dinners even when there were no product unveils was important. At this luxury automotive price point, the final transaction of a purchase is on average cultivated over the course of three to nine months. And while 60% of business is recurring and referrals, there are times when O’Gara is approached with the opportunity to entertain potential new clients. This was when Silvestri saw the showroom and then saw a dining room. It spells it out in the last sentence, but Silvestri had started planning dinners in the showroom. This was the first creative solution to using a budget to the fullest. Not only does this keep the new clients close to the product if they so desire to go for a test drive or want a product overview, but this also gives them the chance to see the world class facilities O’Gara Coach has built for such an exclusive brand in the heart of Beverly Hills. A Rolls-Royce showroom, in Beverly Hills, what else could be more appropriate to accompany the dinner than the guests. For one particular dinner, the guests were the partners at Morgan Stanley. Upon their arrival, the valet took the cars at the entrance of the courtyard, and their first impression was walking along a black carpeted pathway along a lineup of the current Rolls-Royce product line. Waiting to welcome them at the end of the carpet were model wait staff, provided by Runway Waiters, with gourmet hors d’oeuvres and Thienot Champagne. From there they were greeted by O’Gara Coach’s very own brand ambassadors and product specialists, and entertained by the music of a violin trio, Alira Strings. 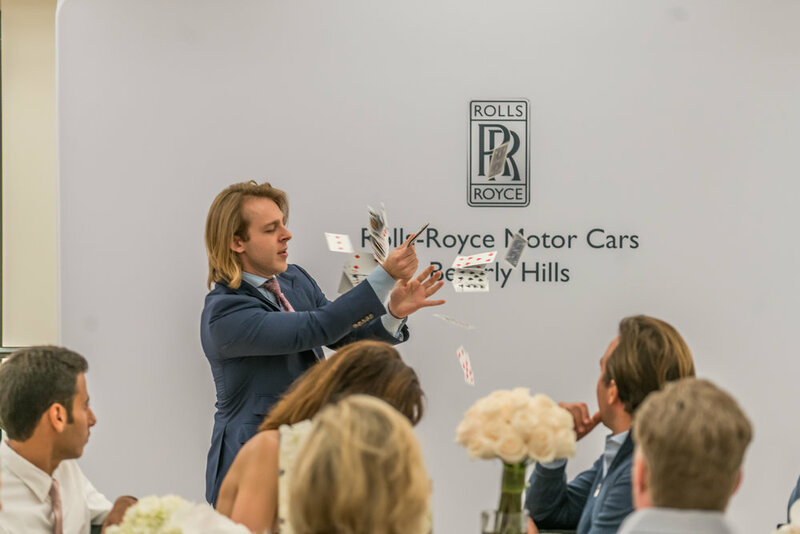 The music choice was modern with an imaginative and classic twist to meet the rich poise of the Rolls-Royce brand, and the modernity of the Beverly Hills businessmen. Once all parties had arrived and the partners of Morgan Stanley became acquainted with the O’Gara Coach team, it was time to sit down to dinner. Originally home to the automotive masterpieces, and still was in the first room that guests had entered, but in other places transformed. As they made their way past the bespoke configuration studio and through to the last room, they were walking into a dining room with a table set for 26 adorned with pieces from Tic Tock Couture Florals. Upon being seated, the three course meal commenced. To start, a lobster and halibut stuffed ravioli paired with Cantina Della Volta Rose. The main course consisted of beef tenderloin filet with asparagus and Campari potatoes grains, paired with a glass of 2012 Burson IGT Ravenna by Randi. And dessert was the group favorite, creme brulee with edible lavender to give the sweet treat a fresh and floral taste. To finish the night Magician Rmax joined the dinner party, leaving guests astounded. Nights like these are what make the O’Gara Coach experience one of a kind, for clients and partners alike. Photo source: Rolls-Royce Beverly Hills Website.